HELIKE (USA) (Chestnut 2001-Stud 2007). 2 wins at 2100m, 2d Grand Prix de Marseille, L. Half-brother to SW Moon Driver. Sire of 58 rnrs, 29 wnrs, inc. SW Up Cups (TRC Hobart Cup, Gr.3), Hellova Street, Moonless, Like a Carousel and of Smoke 'n' Whisky, Helluce, Si Siempre, Keukenhof, Maleesh, Master Alfred, One Shot Off, Our Anna, Peron Dunes, Skip to the Moon, Don't be Nasty, Like Alulu, Alpine Angel, Flight Mode, Lost Island, etc. LIKE A CAROUSEL (g. by Helike). 2 wins. See below. KULLU (Elvstroem). 4 wins from 1200m to 2500m, NZ$78,413, CJC Metropolitan Trophy, L, 2d CJC Couplands Bakeries H., Fendalton Eye Clinic H., Waikato RC New Zealand Bloodstock H., Meat Warehouse H., BOP RC Mills Reef Winery & Restaurant H., Counties RC South Auckland Motors Pukekohe H., Cleaning Supplies H., 3d ARC Perfectly Ready H., Avondale JC Morgan Furniture Governor General's H.
WITH A CHANCE (Commands). 18 wins from 1100m to 2000m, A$563,600, STC Winter S., L, AJC Poplar Welter H., PJ Bell Country Championship H.-twice, Just a Dancer Welter H., Liverpool Leader Welter H., STC Winter Challenge Final, AJC Coralie H., Little Bay H., STC Gold Slipper Festival H., 2d AJC Spring Valley Welter H., Star of Florida Welter H., STC Allied Express Welter H., 3d STC Parramatta Cup, L, AJC Hayai Welter H., Club Rivers H., Arrowfield Stud H., STC Summer Stitches & Craft Show H., Bacardi Breezer Welter H., Star City H., AJC Broker's Tip H.
Race Record: 38 Starts 2-7-3 A$461,190. 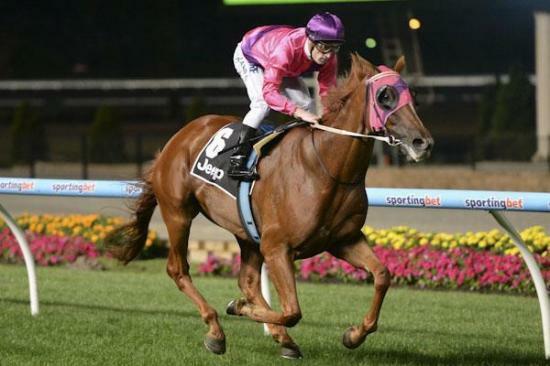 2 wins at 2400m, 2500m, A$461,190, to 2014-15, MRC Harry White Classic, L, MVRC MSC Signs H., 2d MRC Sandown Cup, L-twice, VRC Carnival H., 3d ATC Sydney Cup, Gr.1, Geelong Cup, Gr.3, MRC Salt & Pepper P., 4th SAJC Adelaide Cup, Gr.2, VRC Queen's Cup, Gr.3, St Leger, L, MRC Sandown Cup, L.